Have you ever felt like walking at the bottom of the ocean and seeing what goes on down there? Now….. you can do it. 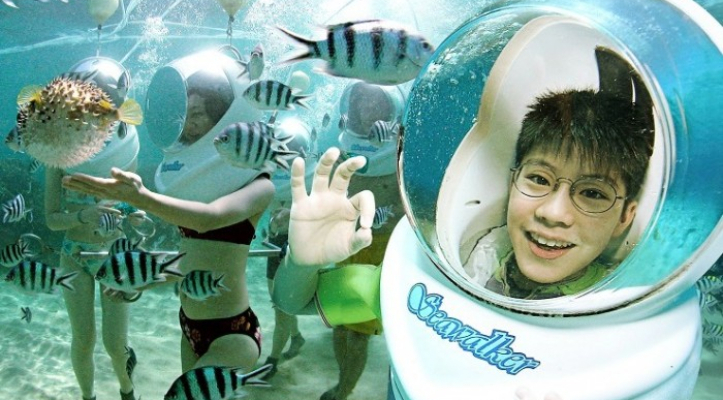 You can walk right through the bottom of the ocean and view all kinds of amazing sea life. With our unique diving system, you will be able to experience a dive down deep. Seawalker is ideal for those who would love to explore life under the sea but are not confident swimmers or do not wish to dive. Seawalker is a soft dive system. You’ll be equipped with the latest in marine exploration technology, a helmet with transparent visor, no air tank necessary, so you’re lightweight and flexible. Explore the stunning underwater life of Bali where you can walk at the bottom of the sea and come face to face with sea life whilst breathing the same as you do on the surface. All training is provided of course. It was a quite awesome experience. I've never been that deep into the sea and the fishes surrounded us. However, the glass of the helmet was blur, it would be nicer if I could see things clearer. I did buy the CD of my photos and video, the photos are ok but the video is so blur, BBM should upgrade or change the camera, GoPro for example. We had a memorable time on the Seawalker tour. Our pickup was onTime and everyone we encountered was professional! I was honestly very impressed with their how professional the crew were. There were at least 4 divers to a team of 6 people and we constantly felt safe. Things were also done very systematically and quick even though we had to wait quite awhile due to the strong winds and choppy waves. Definitely would recommend this experience!!!!! Very good experience for first timers like us to experience the underwater feel .Well organised activity...Really liked the experience. Nice experience! should ready your own waterproof camera. The staff really take care of you when you are in the water, very enjoy and friendly staff! We really loved it, but sometimes it's difficult to enjoy the moment because everything is really fast. Great professionality, we felt safe in every single moment. Great support underwater. It's a must to do! All staff handling this activity was professional. We had a great time walking under the sea and lunch provided was also very good. Highly recommended ! In reality, the visibility was rubbish as the sea was so murky. We saw a ball of fish around us for 10 minutes before we were dragged around on a chain looking at nothing else....because there was nothing else ....then we were up the ladder. Not worth the effort or money. Sea walking was a nice tour. Company picked us up at the hotel, provided short instruction, shower, lunch. . Actual walking under water was not 30 minutes as advertised, but close to 20 minutes. It was enough anyway. There was a little current under water that we had to fight a little, but nothing to worry because you will be holding to a bar and two instructors are with you under water all the time. Lunch did not include drinks and we had to pay for it. That lunch was served on the beach. So you eat and watch the beach and one guy was parasailing. Very nice. This tour was so much fun! During the Seawalking we really came close to all the fish and it was very cool. The lunch was served at the hotel who had the Seawalker tour and you got to choose your lunch from a special menu. We chose a burger that was one of the best burgers I've had. Would totally recommend this tour!! The seawalker experience itself was great. We saw lots of fish and other sea life. The quality of the photos and video were not worth the money. The photo/video of the attraction is too expensive to be honest. And the quality of the photos are not even that great. I had my action cam with me luckily. Otherwise we had to pay 36 dollars for both of us to get the videos and photos. My husband and I are not very good swimmers and could only enjoy limited sea activities. This was an awesome experience, if you like being in the water and being surrounded by fishies. They also gave us a bottle of proper fish food to attract the fish. Booking the package with photo and video ahead of time may be a more economical choice than having to buy it after the activity. it's really a fantastic way to explore the ocean! During the walk on the seabed, the professional diver always on our side to ease our tension. No worries at all. Good experience, but did not last long enough. The fish experience was nice especially when we fed them. The equipment is good but overall a lot of money for amount of time you have there. The lunch menu was spot on, especially if u like burgers.